Local Anesthesia is useful in many dental treatment procedures and there are many complications associated with the administration technique and also with the composition of certain components of the agent present like allergic reactions and other conditions which are divided into Local and Systemic. One of the most common Complication seen in Syncope which can be caused due to many reasons and the Dentist should be ready at all times to deal with it in a rapid manner. Some localized complications due to Local anesthesia are – Anaesthetic Necrosis which is is seen as a localized necrosis of soft tissue surrounding the injection site. The complications can be as simple as the above mentioned necrosis or some times severe systemic complications like Cardiac Arrest which can be seen if proper history of the patient is not collected before going ahead with the administration of LA Agent. Any deviation from the normally expected pattern during or after the securing of regional analgesia is termed as a complication due to Local Anesthesia. In this image a case of Occulomotor palsy which is seen as a complication of inferior alveolar nerve block when it is given into the parotid gland and affects the Facial nerve. A Primary complication is one that is caused and manifested at the time of anesthesia. A Secondary complication is one that is manifested later, even though it may be caused at the time of insertion of the needle and injection of the solution. A mild complications is one that exhibits a slight change from the normally expected pattern and reverses itself without any specific treatment. A Severe complication manifests itself by a pronounced deviation from the normally expected pattern and requires a definite plan of treatment. A Transient complication is one that, although severe at the time of occurrence, leaves no residual effect. A Permanent complication would, of course, leave a residual effect, even though mild in nature. And without Adrenelin 1.8ml I can wait for the whole life in you. I had a infra orbital done on nerves on my cheek. My pain is worst than before he did it. I can’t understand what went wrong been back to him many times with no relief. It was for the triemintal nerves. It’s gonna take months before this stuff is out of my cheek. Has anyone else had this procedure it was done by a pain doctor. If there is an injury to the Nerve, it will take sometime for the nerve to heal itself and you need to take certain precautions to avoid any trigger factors if you are having any. The Dr will give you some medication to help in the healing of the nerve faster, but you need to give it time to subside. Hi Varun, my name is Ana and I have had major complications with the injection I had in my gum. First, I am very sensitive to the anesthetic. I always get tachicardia, shakiness, anxiety, and sweat profusely. My dentist knows that. I got crowns in my to front teeth and he put such a large volume of regular anesthetic (without epinephrine) due to my sensitivity to epinephrine, but it did not work, he had to inject the freezing every 2 to 3 minutes. The pain was unbearable!!! So, in spite of him knowing my sensitivity, he still gave me the anesthetic with epinephrine! To top it all, the temporary crowns were too tight, and I told him so, but he did not listen to my concerns! I went home and I could not even work for two weeks. I also lost 7 pounds because the pain was so terrible in my front teeth and the gum right behind them. My gum tuned black and shrank from January 8th to January 30th. I could taste rotten flesh in my mouth and even my husband complained of my bad breath. Finlly, yesterday at work, the piece of gum fell off and the pain was immediatelly of the charts!!! I went to my dentist today and he said I have an ulcer!!! I guess that I had gum necrosis! Imagine that! Now, I have to see a gum specialist tomorrow, but I hope that my dentist pays for it, otherwise, I will have to suit my dentist and I really do not want to do that! Thanks so much for this site. I wonder if you could have an advice for me. Thanks again. I had a root canal back in April that was broken into two visits, the second visit the Dentist was unable to get me numb which resulted in her giving me several injections more than 6…which then caused anaesthetic necrosis at the injection site that has not healed in over a month now. I was given a mouth wash and told to use for 10 days and rinse with salt water, it’s not completely healed and its been over a month and no one has returned my calls. So my crowns have to be put on hold until I have completely healed. What should I do? Any suggestion will be greatly appreciated. Are you feeling any pain or is there any yellowish discoloration at the necrosis site ? 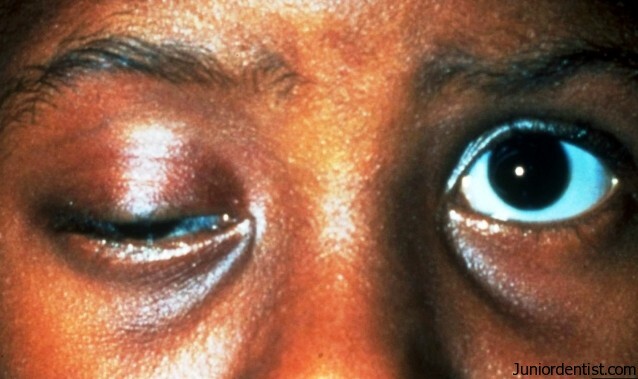 If the Necrosis does not heal for such a long time we usually prescribe a corticosteroid or antibiotic gel depending on the clinical symptoms and appearance of the lesion. It is difficult to comment on your condition without any clinical examination, it is better to go back to your dentist and get it checked. Lesion not subsiding for over a month is something which should be checked. I have undergone extraction of impacted 3rdmolars under local anesthesia before 1 year but still experiences numbness in the lower lip region… I have taken medications for nerve growth…but the condition hasn’t improved. What should I do now? Is it a permanent damage…? It appears to be permanent damage, there is not much you can do about it. Just make sure that you do not injure your lip while chewing and talking. The regeneration of the nerve fibers depends on the amount of injury to the nerve, if it is extensive then regeneration is impaired.